Is your child growing up and ready for their first pillow? Start out with something that has the right fill and fluff: a Dreamtown Pillow. We've been reviewed and recommended by chiropractors as the ideal sized pillow and fill for ages 2-5 yrs. Your child or toddler will love having their very own pillow: to sleep, for naps at school or daycare, for rides to the grandparents or long trips out of town. For some toddlers, a familiar blanket or pillow can provide comfort when sleeping or when away from home. Dreamtown Kids LLC is a family owned and operated business. We're constantly looking for practical and safe solutions for parents like us! All our pillows and cases are manufactured and shipped from the USA. Both pillowcase and casing are a blend of various cotton and polyester fibers and the filling is made from two polymers by spinning and joining them simultaneously. The final result is hollow slick light polyester that is crimped for extra resiliency and soft to the touch. Its suggested that if you're concerned about allergies to use polyester or a poly blend over natural fibers. Our materials do resist mold and mildew from occurring but nothing is mold proof so please follow care instructions to further prevent mold and mildew. Pillowcase: Machine wash normal with like colors. Dry on normal cycle. Pillow: Machine wash cold. Tumble dry gentle, low heat. Pound on flat surface to reset fibers. Fluff to shape. If for any reason within the first six months our pillow doesn't fit your expectations or if something is wrong with the pillow then we will replace it at no additional cost or refund your money. We are proud of our product and when you receive yours you will be happy with it too! 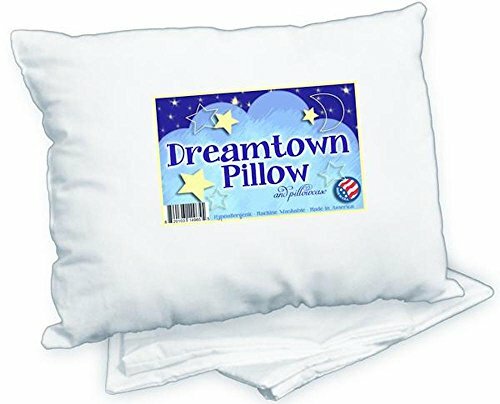 Click "Buy" and get your own Dreamtown Pillow. TRULY CHIROPRACTOR RECOMMENDED as "perfect first pillow!" Size: 14in x 19in. Not too small, not too large, perfect for your child. Contains a dense yet soft fiber so we can use less filling than most toddler pillows to give the best neck support and prevent kinks or chiropractic visits. Our pillows and pillowcases are 100% Hypoallergenic, Mold Resistant and Mildew Resistant. We hold a Child Product Certificate with testing for Heavy Metals as well as mold and other microbials performed and certified by CPSC approved labs. The Poly/Cotton is blend is affordable, cost effective and allows for pillow and case to be machine washed and dried without worry not like 100% cotton that shrinks. Makes for easy cleaning and care. (please see Description for washing care instructions). Tested and proven to help sleepy toddlers, boys and girls with sleeping better in bed, during a nap, at daycare, travel to grandma's or traveling in a car or airplane. Pillows for kids give them security, familiarity and make them feel like they're growing up! A kid pillow is also more comfortable to sleep on than a stuffed animal. Not recommended for a baby under 2 years old. If you have any questions about this product by Dreamtown Kids, contact us by completing and submitting the form below. If you are looking for a specif part number, please include it with your message.